It is always great news in Las Vegas when new slot machine themes and games are created for their gambling floors. In this case, there will be three new themes that are either already being put in place or are in the process of being developed as we speak. 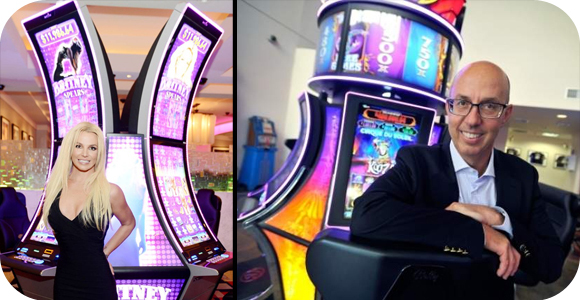 Each machine will bring something completely new, either using a celebrity, a popular TV show, or even a Vegas show as its inspiration. Inspired by the pop singer Britney Spears, the company Aristocrat has just recently launched the new game at various casinos around Las Vegas. It includes 60 paylines with a 50-credit minimum bet, where players can wager up to 500 credits, and has a coin range of 1₵ up to $20. Some of the bonus features include famous songs by Britney including “Equalizer” and “Oops I Did It Again Re-Spin”, and others like “Toxic Picks” and “Hit Me Baby One More Time Wheel”. It seems that Lionsgate has just unveiled its plan to make a game themed after the popular TV show, Orange is the New Black. Working alongside with International Game Technology, they announced two versions of the slot machine during the 2015 Global Gaming Expo in Las Vegas. Each game offers potential multi-level awards for spinning wagers displayed on a 55” top screen, while players also experience clips, music, characters and sound bites from the prison-set drama. You will see a lot of Piper Kerman, the main character of the show that is played by Taylor Schilling. The games are set to roll-out in 2016. The famous circus show that made its start in Las Vegas in going to have its face on another Vegas commodity, the slot machine. Scientific Games Corp. is one of the industry’s largest manufacturers, and has signed a licensing agreement with the Montreal-based entertainment company in order to create a game based on the Cirque’s acrobats, characters, and music. With the first game having being presented on Tuesday at the G2E, the gaming industry’s largest conference and trade show. This goes along with the gaming industry’s efforts to revitalize the slots market, bringing in new games that will offer different options to younger players. Along with the newly passed law allowing the creation and use of skill-based games, this will work out well for the casinos in Las Vegas.